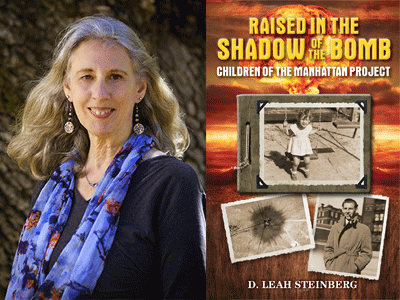 Local writer D. Leah Steinberg discusses her intriguing new work, Raised in the Shadow of the Bomb: Children of the Manhattan Project. This story began before I was born, when my father, Ellis P. Steinberg, and uncle Bernard Abraham worked on the secret undertaking that developed the first atomic bombs. These later were dropped over Hiroshima and Nagasaki. It was not only my extended nuclear family that experienced and was affected by growing up at this time in history, but a whole generation of other children raised in the shadow of the bomb who had stories to tell. The result is this book--part memoir, part discussions with siblings and cousins, and part interviews with a dozen others who had a parent who worked on the Project. About the Author: Deborah Leah Steinberg is the daughter and niece of scientists that worked at the University of Chicago Metallurgical (Met) Lab a branch of the Manhattan Project during WWII, the secret project that researched and developed the first atomic weapons. Leah has degrees in Anthropology, and Counseling Psychology with a career in research and clinical Sleep Medicine and counseling. She is a published poet, a nature photographer, a music lover, and loves to dance. She lives in the San Francisco east bay area.